The wearable of the week goes to Vuzix for their M100 enterprise smart glasses. Vuzix is a leading supplier of video eyewear and smart glass products in the enterprise, consumer, commercial and entertainment markets. The M100 smart glasses has both enterprise and consumer applications, giving its users hands-free access to the digital world. In simplest terms, smart glasses that provide all the features and capabilities of a modern smartphone in a hands-free wearable device. 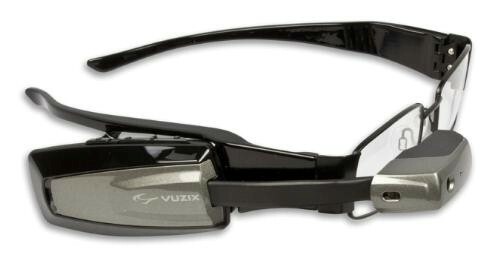 The Vuzix M100 is equipped with a display, audio output, a built-in camera, a microphone and GPS tracking capabilities. The smart glasses are essentially an android-based wearable computer with recording capabilities as well as wireless connectivity via Bluetooth or Wi-Fi. The M100 has a powerful processing engine and its own operating system so you can download most apps directly to your smart glasses. With pre-installed applications you can record and playback pictures and videos, track timed events, manage your calendar, link to your phone and many more. Besides the M100 giving you the ability to record HD video and take pictures, you can also recognize objects and gestures, as well as use voice commands. Also, it has the power of a smart device, only it’s hands-free and compatible with your favorite apps. Meaning, the options are endless—you can get directions, scan barcodes, stream videos, receive phone calls or notifications… all this without lifting a finger. We at Humavox have special respect for pioneers. Vuzix has always seen and advocated the enterprise smart glass potential and as evident in recent research, rightly so. With the smart glass market predicted by Grand View Research to be worth approximately $4.71 billion by 2022 and with the enterprise world being a great part of this growth engine, Vuzix is definitely on the right track and in the right market. 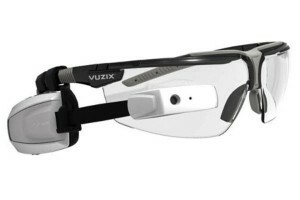 The Vuzix M100 smart glasses are the world’s first commercially available hands-free display and wearable computer designed for enterprise users. We believe these glasses have great potential as an information source that could provide on the spot instructions, illustrations, procedure displays, history retrieval, documentation, remote communication and task management. They act as a virtual assistant at the disposal of enterprise workers, revolutionizing and improving their working experience. Moreover, through the eyes of the enterprise, the M100 has the capability to increase efficiency, industrial safety and productivity by allowing workers to effectively manage data, consult relevant experts, retrieve guidelines and quickly extract information. With smart glasses as a hands-free database-gateway, valuable time is saved, translating directly into cost reduction and more effective use of man-power. What makes Vuzix so special? Vuzix is intelligently creating an entire ecosystem to support effective integration of smart glasses in the enterprise world. Whether it be by creating a partnership with Pristine, an enterprise platform solution for smart glasses that among other things powers secure and scalable audio/video streaming; or making the Vuzix M100 more applicable to its audience by making it now available (for the first time) in a prescription capable safety glass format. Either way, it is evident that Vuzix is creating the right infrastructure needed for effective adoption. In the enterprise world especially in the realms of industrial equipment, healthcare, field service and the like, having a hands-free display before your eyes is a great asset. Creating a whole ecosystem that supports this function to ensure smooth sailing, makes it even better. By ensuring comfort for enterprise use, workers will want to adopt it and companies will in turn increase productivity. So congratulations to Vuzix M100 Smart Glasses, we thank you for giving us hands-free access to the digital world and improving the way we work. Humavox Wireless Charging for your wearable.